Arsenal travelled to France yesterday ahead of tonight’s match with Montpellier. The headline news was that Wojciech Szczesny failed to get the flight – not because he forgot his passport or had a Final Destination-style premonition that the plane would crash – but because he has an ankle injury. It’s an intriguing situation. During the second half of Saturday’s game with Southampton, in which Szczesny dropped an already infamous clanger, Vito Mannone was sent out to warm up. At the time I wondered if Arsene was trying to keep the Pole on his toes by reminding him of the competition. Now it seems more likely there was already concern over Wojciech’s fitness – with some suggesting he may have landed badly on his ankle just as he dropped the ball and allowed Fox to score. When quizzed after the game as to whether Szczesny was fully fit, Arsene dead-panned back, “That’s what I am told”. He seemed to be harbouring an irritation – perhaps with Szczesny, who irked by the threat of Mannone and eager to put the horrors of EURO 2012 behind him, may have come back before he was entirely ready. With a huge game at Man City on Sunday, no risks will be taken at this tage, and Mannone will start tonight, with youngster James Shea on the bench. The only other change to the 18 man squad is that Abou Diaby has returned and takes the place of Andrey Arshavin. It’s telling that in Saturday’s game, Arshavin was not even ushered from the bench to warm up. It’s clear he is way down Arsene’s current pecking order. There’s due to be some rotation tonight, so perhaps Theo will benefit. I’m not so sure myself. Aside from Mannone, I think Laurent Koscielny is the one man guaranteed to come in. I also anticipate starts for Andre Santos and Olivier Giroud. Abou Diaby would not have travelled if Arsene wasn’t giving serious consideration to playing him, and whilst there’s an outside chance of Aaron Ramsey replacing Santi Cazorla, the Spaniard is already so integral to our game that I simply can’t see him being left out. If Giroud does start, he’ll be immediately under the spotlight once again. It’s funny – Arsene said he left him out of the Southampton game to reduce pressure. Perhaps it would’ve been smarter to play him against the Saints and then leave him out of what’s sure to be an emotional night against his former club. Giroud, however, will be desperate to play – and I think we need him to. I think Arsene needs to take another look at him before deciding between him and Gervinho for the centre-forward role at Man City – the two have such different styles and the manager will want to be making an informed choice. It’s a strong side and one that should be capable of getting a positive result against an out-of-sorts Montpellier. Arsene Wenger is banned from the touchline, so Arsenal will be under the command of Steve Bould – something I have a growing suspicion and hope we might see more of in the future. Come On You Gunners. When the Champions League draw was made, a lot of hullabaloo was made about the perceived difficulty of Manchester City’s group. So much so that our treacherous passage passed almost without mention, which was even surprising considering that, lest we forget, we were a club ‘in crisis’. As United and Chelsea geared up for predictable processions, a shaken Arsenal side were set to face the Champions of both Germany and Greece. City’s ‘group of death’, it should be noticed, does not contain a single domestic Champion. And yet this morning, Arsenal are the only English side qualified for the knockout phase. Not only that, but we can play our final group game away to Olympiacos safe in the knowledge that whatever happens, we will win the group, thus avoiding the likes of Bayern, Inter, Madrid and Barca in the last 16. I’m sure I’m not alone in feeling tremendously proud, which is something that was difficult to envisage in the dark days of August. So much credit is due to Arsene Wenger and the team for the way in which they’ve turned things around. Hopefully reaching this milestone will provide a significant confidence boost as we chase our goals for the rest of the season: principally, making sure we’re back in the competition next season. Dortmund started brightly, but their plans were disrupted by two injuries in quick succession. First, Sven Bender launched a tackle at Thomas Vermaelen. Against a mere human, Bender would doubtless have walked away unscathed. After tangling with The Verminator, however, he found himself with a jaw that was broken in two places. Ouch. Moments later, Mario Götze came off worse in a clash with the imposing Alex Song, and limped off. The playmaker had started brightly, and was naturally a big loss to a Dortmund side whose work ethic and incisive passing had made them a real threat early on. Arsenal didn’t manage to carve out any clear-cut chances in the first-half, but within four minutes of the second they were ahead. Alex Song seemed possessed by the spirit of Thierry Henry, who was looking on from the upper tier, as he picked up the ball on the left-hand side and waltzed past four defenders before looping a wonderful cross to the back post. Predictably, the man there to meet it was Robin van Persie, who planted a firm header beyond the goalkeeper. It was a fantastic piece of individual play by Song, and a telling contribution towards his man of the match performance. It’s somewhat ironic, however, that his most memorable moment was a piece of attacking play, because it was on the defensive side that he really excelled. He played deeper than usual, and did some superb work covering the forward forays of Andre Santos. It’s no coincidence that on a night where Song patrolled in front of the back-line so effectively, Santos had his best game in an Arsenal shirt. The same should have been sealed shortly after. Aaron Ramsey, inventive and industrious in midfield, played in Gervinho. However, the Ivorian is clearly yet to find the shooting boots he mislaid so spectacularly at Carrow Road, and he rounded the keeper only to hesitate and allow the chance to go by. His finishing simply has to improve: at some point, misses like this will cost us. Not last night, however – thanks again to that man, Robin van Persie. I had pleaded in my preview for someone else to step up to the goalscoring mantle, but it wasn’t to be. The Dutchman just cannot stop scoring. The goal that clinched the game typified the groove he is in – stepping away from his marker early to reach a Thomas Vermaelen near-post flick on and tap in to an unguarded net. He now has more than four times as many goals as our next highest scorer. And, at last, we’ve managed to score from a corner. There was a late consolation for Dortmund, with Kagawa side-footing home after some slack defending from substitute Johan Djourou. Hearteningly, Thomas Vermaelen was furious and berated his team-mates. We’re beginning to take pride in the game’s less glamorous elements. Their fans deserved to see a goal. They were superb throughout the ninety minutes, even managing a chorus of “You only sing when you’re winning” in perfect English. In recognition, Arsenal fans concurred “we only sing when we’re winning”. But last night, we had plenty to sing about. And, after all, we only needed One Song. It will be a cold, crisp night at the Emirates as Arsenal play host to Borussia Dortmund. The Champions of Germany are in terrific form, and it promises to be the sort of evening that makes this competition so alluring. The objective for Arsenal is simple: win, and achieve qualification. Failure to do so could leave us needing a result in Greece when we face Olympiacos: hardly a reassuring prospect. After the ill-fortune of drawing Barca last season, our focus should be not just on qualification, but on topping the group to ensure an easier passage in the next round. Dortmund have plenty to play for too. Defeat could put them out of the competition; victory would leave them facing what would effectively be a play-off against Marseille. Like us, they had a slow start to the season but have recently found an impressive level of consistency, culminating with a 1-0 win away to rivals Bayern Munich at the weekend. As a consequence of our own good form, I don’t expect Arsene to make any changes to the team that beat Norwich at the weekend. In the interim period, we have lost Tomas Rosicky to injury, but that bad news is tempered by the surprise inclusion of Abou Diaby in a matchday squad for the first time this season. I had genuinely begun to forget that he even played for us, so having him back as an option is a pleasant surprise. “When Per came here he was not completely fit. But now he is getting stronger and stronger. I felt on Saturday he had not recovered from Germany’s game with Holland and looked tired. He has recovered now and will play tomorrow. In England, when you’re in front of the striker you have not won the battle. In many countries you have. But they fight till the last second here. Of course he is under pressure and scrutiny. Yet you don’t feel sorry for a situation like that because it’s what happens at a big club. I have to say I think that, for the most part, Mertesacker has done very well. The Morison incident was undoubtedly a major error but all defenders are prone to that kind of nightmare once in a blue moon. In fact, I don’t think Arsene would be wise to carry on talking about the German’s ‘critics’ – it is reinforcing the idea of him as a dubious signing and potentially damaging the player’s confidence. However you evaluate the acquisition of Mertesacker, it seems Arsene has his heart set on doing some more shopping in the Bundesliga. After Raphael Honigstein reported earlier this week that Arsenal had not yet abandoned their pursuit of Mario Götze, Arsene indicated to the German press yesterday that he might hold an interest in the Dortmund playmaker. I don’t expect any movement in January, but I can envisage us lining up an unusually high-profile attacking signing for next summer, to replace Fabregas and Nasri and allay the fears of Robin van Persie. Götze or Lille’s Eden Hazard would certainly fit the bill. What both players would potentially add is goals from a source other than our skipper. Whilst it has been enthralling to watch him hammer the ball in to the net at such an alarming rate, it does slightly mask a dearth of goals from other attacking players in the team. RVP currently has 15, and our next highest goalscorer is Theo Walcott with 4. Gervinho, the third striker in our line-up, has just two – although he should have at least doubled that tally on Saturday alone. If we are to win tonight, it would be nice to share the goalscoring responsibility around somewhat. That said, any win will do. Come on you Gunners. You know what, Chelsea? You can keep your 5-0 romps. Truly, there is no sweeter way to win a football match than with a solitary last-gasp goal. More than ninety minutes of turgid entrenchment punctured by one sweet strike from substitute Aaron Ramsey. Cue much air punching, back-slapping, and (in my house at least) spilling of tea. To say it was an average game would probably be generous. After a promising start, it fizzled out, which felt a little like seeing Joey Barton on fire, and then having some jobsworth health and safety officer throw water over him. The closest we came to goalmoath action was a shout for handball at either end, with Carl Jenkinson and Souleymane Diawara the men lucky to escape censure. Andre Santos also carlessly handled the ball having already been booked, and was probably lucky not to be sent off. If you knew nothing of Santos, just five minutes watching him would enable you to guess he was Brazilian. Plenty of skill and imagination on the ball, but a tendency to overplay and take some quite insane risks. Needless to say, he is fitting in perfectly at Arsenal. The basic problem was a lack of quality in the final third. Marseille lacked ambition; Arsenal urgency. Andrey Arshavin had been selected ahead of Gervinho but was having a nightmare of a game. At least he would occasionally find himself on the ball – the same could not be said for Theo Walcott. The second-half introductions of Johan Djourou and Gervinho for Carl Jenkinson (injured) and Theo Walcott (AWOL) threatened to bring our right-flank to life, but it looked for all intents and purposes as if Arsenal were playing out a creditable 0-0 draw. I even began composing a blog, now thankfully discarded, which reported the result as fact. There were positives to be drawn. Laurent Koscielny was quite outstanding at centre-back, with Per Mertesacker equally assured alongside him. 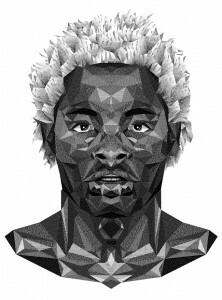 Ahead of them, Alex Song added to what is becoming an increasingly impressive portfolio of performances this season. He breaks up the play well, and uses the ball intelligently. Next to him, Mikel Arteta showed more graft than craft with a number of crucial and crunchy challenges. The advantage of signing players with Premier League experience is that they usually know how to scrap. The frustration was that Marseille were clearly there for the taking, if only Arsenal could up their game. In the end, the man to release the figurative handbrake was subtitute Aaron Ramsey, who collected a Johan Djourou cross, miscontrolled by Gervinho, and fired low in to the near post – the perfect way for him to prepare for a game with Stoke at the weekend. And so it finished: 1-0 to the Arsenal, with our first clean sheet away from home in Europe since Milan ’08. “We left it very late but we had a difficult start. We lost some balls in the first half due to the fact Marseille pressed us well. It leaves us top of the group, and a win in the return fixture would all but guarantee our qualification to the knockout stage. Quietly, without anyone taking much notice, Arsenal have won five of their last six games. It’s not quite a resurgence, but it’s certainly a relief. Long may it continue. Arsenal picked up their first win of the Champions League group stage last night, meaning we were the only English side to win in Europe’s premier competition this week. We also now have more Champions League points than Manchester City and Manchester United combined. Arsene gambled a little with his team selection, and got away with it. I support his decision, and would have done even if it had backfired. We have a huge squad now, as the fact that even with the amount of injuries we’re carrying we were able to rest players demonstrates. The XI he picked was plenty strong enough to win this game at home. With that said, I think we all may have been guilty of underestimating Olympiacos a little. Granted, we don’t see much of them in England, but I thought they were great last night – all technically capable, and organised too. They were smart in their tactical play, looking to break against our attacking midfield, and closing down Mikel Arteta whenever he got the ball. Their goal was the result of some intelligent thinking: recognising that we’re adapting to a new zonal marking system, they threw a spanner in the works by taking short corners. Frankly, we looked as if he hadn’t covered that situation in training yet. They looked the more dangerous side for long periods of the game, but fortunately we were already two goals ahead thanks to strikes from two recent signings. First, Alex Oxlade-Chamberlain continued his impression adaptation to top-level football by dribbling inside from the right and firing left-footed across the goalkeeper to become the youngest ever English goalscorer in the Champions League. The second and third youngest, in case you’re wondering, are Theo Walcott and Jack Wilshere. Andre Santos’ goal also came off his wrong foot. He galloped forward to meet a Tomas Rosicky through-ball, but his cross for Chamakh was cut out. When the ball rebounded back to the cavalier left-back, he skipped in side his man and knocked a right-footed effort in at the keeper’s near post. We did struggle to retain possession at times – Emmanuel Frimpong looking particularly raw in midfield – and Olympiacos gave us the fright of our lives by striking the crossbar from range in the second-half with an effort that probably deserved better – but we held out for the win. 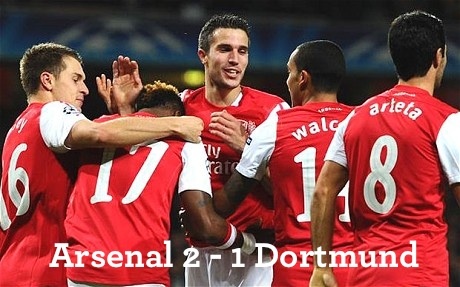 There were plenty of positives for me, particularly with the makeshift centre-half pairing of Song and Mertesacker. Song was tenacious and calm on the ball, and the German had his best game in an Arsenal shirt. I’ve noticed an interesting trend in his play: unlike most Arsenal centre-halves, he doesn’t charge straight towards the ball. At times he backs away or runs in to an area which seems to make no sense – only to be perfectly positioned to clear when the cross comes in. He’s economical and efficient – at times last night he knew when his best option was just to boot the thing away. I also felt Santos played well, and the battle between he and Kieran Gibbs looks set to run and run. Santos has a remarkable upright dribbling style – his touch is immaculate and last night he showed some steel to match the flair. For England – and, more to the point, for Arsenal. In summary: we won. United’s home draw with Basel shows how treacherous these games against ‘lesser’ opposition can be. The Greek league is significantly stronger than the Swiss, and we came out on top. I’m happy with that and you ought to be too.